Ha ha! I had to laugh at the title choice, get catchy don't you think? Since being totally smitten with Shabby Chic, country SDtyle decor I decided it was about time I upholstered my very shabby dining room chairs. They where the least bit chic but very shabby as you can see below! 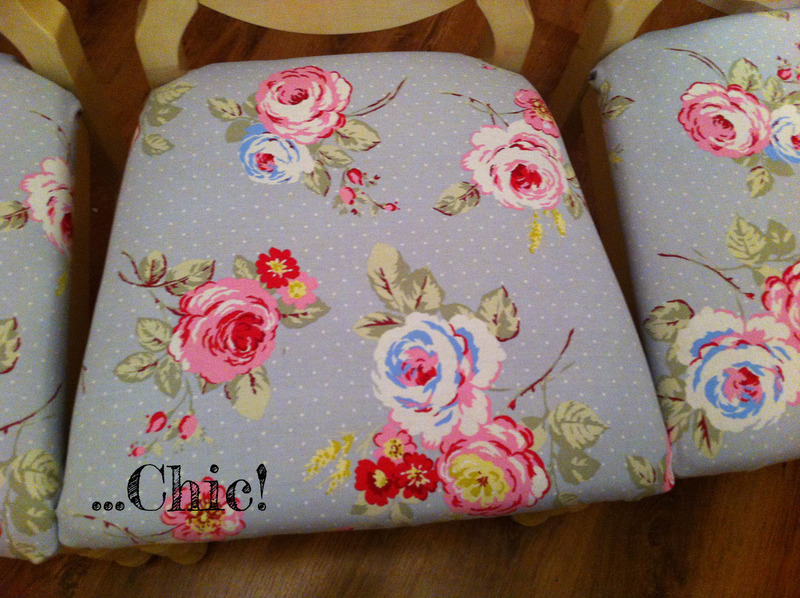 Thankfully after some purchasing and some stapling I soon turned them into shabby chic chairs. 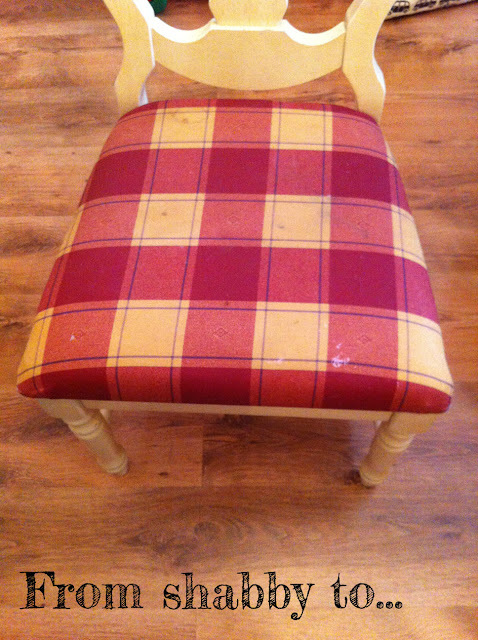 I didn't use my camera to take the photos so I apologise for the quality I didn't have any intentions on blogging about them but have changed my mind and wanted to show you how easy it is to transform your funrniture for very little. I borrowed my Grans staple gun and staples, I think these are relatively inexpensive to pick up. Just make sure you have enough staples and you have the right size for the staple gun! After measuring up the seats themselves I searched for the perfect fabric to cover them, once I saw this beautiful pattern I knew this would be the perfect material. So... one and half metres later I was good to go. You do need a stronger cotton/fabric if you're using it for seat covers etc, this particular fabric is nice and thick and wide making it perfect for curtains and soft home furnishings. After unscrewing the seats I then placed them out where I wanted to cut the fabric, because I picked a fabric which had a pattern I knew they wouldn't all be exactly the same which was fine but I knew I wanted the main big cluster of roses on the seat some where. Luckily I had just the right amount of fabric to play around with. If you opt for a pattern just me cautious you many want an extra half a metre to play around with. I didn't paint them, the photo on the left was taken during the day where as the photo on the right was taken in the evening with the ceiling light on. I hope you enjoyed this post, if you would like to see more posts like this please let me know! Aw I love this idea. Also I now own a staple gun, as I had to buld a fence around my allotment recently. So this would be the perfect next project.